A regular breeding resident and migratory species in Minnesota, casual in winter. The Yellow-bellied Sapsucker was a common species during the Minnesota Breeding Bird Atlas (MNBBA). Figure 1 shows the breeding density of the sapsuckers (Sphyrapicus spp.) in North America. The Yellow-bellied Sapsucker is the species that occurs in Minnesota. It is found across the midwestern and northeastern United States and Canada, southeast to northern Georgia in the Appalachian Mountains, and northwest to Alaska. Relatively high densities are widespread throughout the Yellow-bellied Sapsucker’s breeding range, including in north-central and northeastern Minnesota. Short- to medium-distance migrant; winter distribution includes the southeastern United States, Mexico, the Caribbean, and Central America. Sap and insects, especially gathered from its characteristic sap wells, a series of vertical holes around a tree trunk. The species also consumes fruit and is known to fly-catch. Primary cavity excavator in trees. Breeding distribution and relative abundance of the Yellow-bellied Sapsucker in North America based on the federal Breeding Bird Survey from 2011 to 2015 (Sauer et al. 2017). The Yellow-bellied Sapsucker is a widely distributed species, especially in heavily forested regions and along major river systems. Roberts (1932) identified the species as a “common summer resident, breeding throughout the state.” He documented few nests, which varied in location from the Twin Cities area northwest to Itasca State Park and northeast to Lake County. Forty years later, Green and Janssen (1975) stated the species was a summer resident throughout the forested parts of Minnesota but they found no modern summer records south of the Minnesota River and west of Rice County. However, several years later, Janssen (1987) and Hertzel and Janssen (1998) collectively documented nesting in 49 counties since 1970. The counties included virtually all of Minnesota, except the extreme southwestern counties of Lincoln, Murray, Nobles, Pipestone, and Rock. Janssen (1987) also noted a sight record in Rock County in 1978. The Minnesota Biological Survey (MBS) recorded 1,165 breeding season locations of the Yellow-bellied Sapsucker during its county surveys (Minnesota Department of Natural Resources 2016). It also documented that the dominant distribution was in the northeastern and north-central regions of the state. Locations were sparse in the southern counties, such as Nobles, Pipestone, and Steele, which probably lacked suitable breeding habitats. However, the MBS included three breeding season locations each in Murray and Rock Counties, plus multiple locations in Jackson, Lincoln, and Lyon Counties. Several counties in the south-central region, such as the metropolitan Twin Cities area and western Minnesota, lacked breeding season locations as well. The MNBBA included 3,262 records of the Yellow-bellied Sapsucker and provided additional documentation on the species’ extensive breeding distribution (Figure 2). Breeding records were reported from 7.5% (354/4,750) of the surveyed blocks (Figure 3; Table 1). The 354 confirmed nesting records were most heavily reported from the northeastern and north-central regions, where breeding populations are highest, and in areas where search efforts were intense. Evidence of nesting was also concentrated along the Mississippi, St. Croix, and Minnesota River valleys. Confirmed nesting was relatively high in many of the western counties, especially in the northwest within the Tallgrass Aspen Parklands Ecological Province. A total of 14 new county records were added to those previously reported since 1970. Possible nesting was recorded from several counties in southern Minnesota, but no records were included from Nobles, Pipestone, Rock, Steele, and Wilkin Counties. The probability map based on the MNBBA data indicated high use of the northeastern and north-central forests and avoidance of areas dominated by lowland coniferous forests (e.g., Northern Minnesota and Ontario Peatlands Ecological Section and the Tamarack Lowlands Ecological Subsection)(Figure 4). Lower densities were predicted in western Minnesota and southern Minnesota, but larger populations were predicted in patches in the northwestern region, in the Hardwood Hills Ecological Subsection, and along the Mississippi River floodplain south of the Twin Cities. In their review of the Yellow-bellied Sapsucker in North America, Walters et al. (2002) indicated the species had retracted its range northward from northeastern Missouri. Roberts (1932) is mute on any changes to the breeding distribution of the species from the late 1800s to the early 1900s. In Wisconsin, Robbins (1991) stated the species’ nineteenth-century distribution “encompassed the entire state” and at that time it was described as “uncommon” in the south. Similar statements were made in Michigan, where the species had declined in the south and had become more abundant in the northern portions over the past 100 or more years (Chartier et al. 2013). The massive reduction of trees in the southern and western portions of Minnesota has undoubtedly resulted in a retraction of a substantial portion of the Yellow-bellied Sapsucker population from those areas. Yet scattered populations continue to exist in suitable woodlots of those regions of Minnesota. Aspen, one of the sapsucker’s favorite trees, has increased in Minnesota because of its popularity with the forest products industry. Subsequently, populations of the sapsucker have increased in many northern forests. It is difficult, however, to determine the overall effect increased aspen has had on the population of the Yellow-bellied Sapsucker in the state. Breeding distribution of the Yellow-bellied Sapsucker in Minnesota based on the Breeding Bird Atlas (2009 – 2013). Summary statistics of observations by breeding status category for the Yellow-bellied Sapsucker in Minnesota based on all blocks (each 5 km x 5 km) surveyed during the Breeding Bird Atlas (2009-2013). Summary statistics for the Yellow-bellied Sapsucker observations by breeding status category for all blocks and priority blocks (each 5 km x 5 km) surveyed during the Minnesota Breeding Bird Atlas (2009-2013). Predicted breeding distribution (birds detected per 10-minute point count) of the Yellow-bellied Sapsucker in Minnesota based on habitat, landscape context, and climate data gathered during the Minnesota Breeding Bird Atlas (2009-2013) using the General Linear Modeling method without an adjustment for detectability. In Minnesota, the Yellow-bellied Sapsucker is found in a wide variety of forested habitats, including deciduous to mixed deciduous-coniferous forests, northern hardwood forests, and floodplain forests (Niemi and Hanowski 1992; Green 1995). In contrast to the emphasis by Walters et al. (2002) on the species’ use of early successional forests, the existence of over 5,800 observations of the species in Minnesota national forests emphasized its use of more mature forests (Figure 5). Deciduous cover types, including aspen-birch, lowland hardwoods, oak, and upland hardwood, were used most often (Niemi et al. 2016). The habitat profile of the sapsucker exemplified its wide use of many different forested habitats (Figure 6). It was frequently found in upland coniferous forests, northern mixed forests, lowland coniferous forest, pine forests, and northern hardwood forests. The high frequency of the Yellow-bellied Sapsucker in coniferous forest cover types was surprising when compared with results from the national forests. However, aspen and birch are both frequently found in many forests that are dominated by conifers in the northern regions of Minnesota. For instance, nest sites are often found in trees with fruiting bodies of heartwood decay fungi which is commonly found in aspen (Phellinus tremulae and Fomes fomentarius) (Kilham 1971; Runde and Capen 1987). Heartrot allows for easier excavation of the nesting cavity. Typical breeding habitat of the Yellow-bellied Sapsucker in Minnesota (© Gerald J. Niemi). Habitat profile for the Yellow-bellied Sapsucker based on habitats within 200 m of point counts where the species was present during the Minnesota Breeding Bird Atlas (2009-2013). Partners in Flight (Rosenberg et al. 2016) estimated a North American breeding population of 12 million breeding adults. Overall, Partners in Flight estimated an increase of 46% in the species’ United States and Canadian populations from 1970 to 2014. 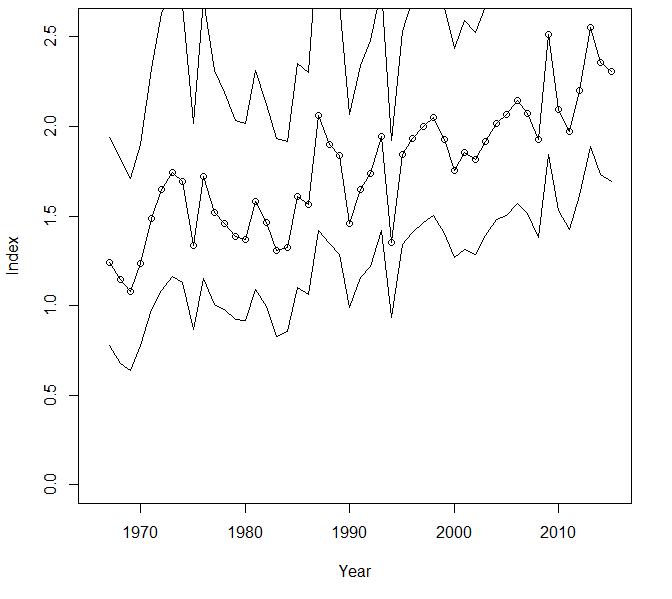 Despite the appearance of an increasing population in Minnesota, the federal Breeding Bird Survey trend was nonsignificant from 1967 to 2015 and during the recent period from 2005 to 2015 (Figure 7). The lack of a significant trend was due to the high variability in detecting this species and to the relatively low number of observations of approximately two birds per route per year in Minnesota. Monitoring of Minnesota national forests, however, indicated a significant and positive regional trend in the Chippewa National Forest and regionally when the data for the Chippewa and the Superior National Forests were combined. The Chippewa National Forest increased 2.66% per year; the combined regional trend increased 1.47% per year from 1995 to 2016 (Figure 8). Overall mean densities of the Yellow-bellied Sapsucker in the Chippewa and Superior National Forests ranged from 26 to 22 detections per 100-10 minute unlimited distance point counts, respectively (Niemi et al. 2016). Within aspen-birch, upland and lowland northern hardwoods, and oak forest cover types in the Chippewa and Superior National Forests, populations varied widely, from 16 to 84 detections per 100-10 minute unlimited distance point counts. The Yellow-bellied Sapsucker is by far the most common woodpecker in these national forests and second in abundance to the Northern Flicker in Minnesota. Breeding population trend for the Yellow-bellied Sapsucker in Minnesota for 1967–2015 based on the federal Breeding Bird Survey (Sauer et al. 2017). 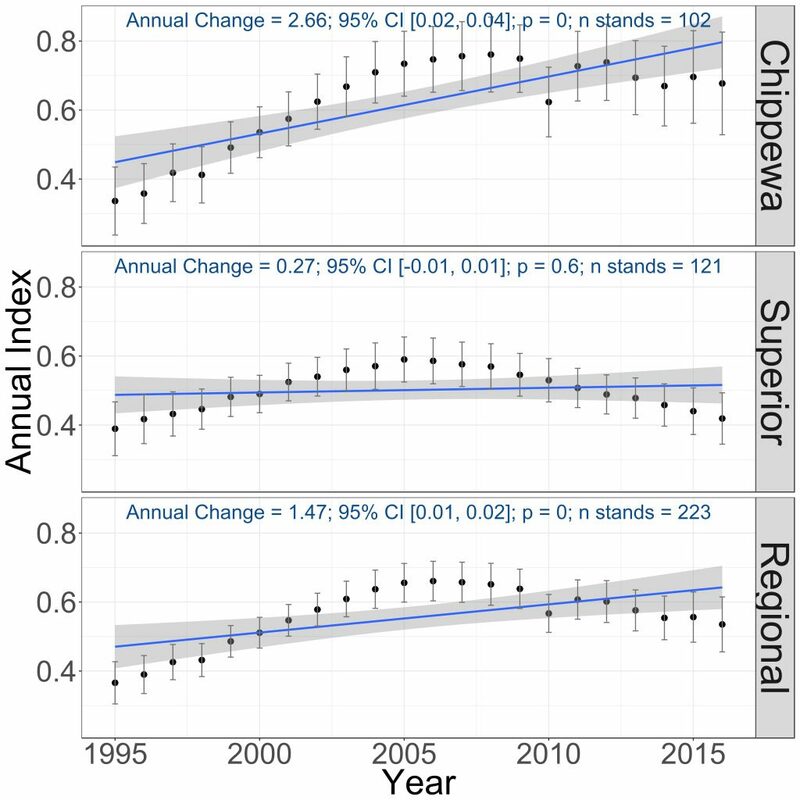 Breeding population trends of the Yellow-bellied Sapsucker in the Chippewa and Superior National Forests and the combined regional trend, 1995–2016 (Bednar et al. 2016). The Yellow-bellied Sapsucker had a low Conservation Concern Score of 7/20 (Partners in Flight, Rosenberg et al. 2016) and thus has attracted little management concern either in Minnesota or nationally. The species has been listed as a federal Species of Concern in the Southern Appalachian region and in Pennsylvania, a Species of Conservation Concern in southern Ontario, and “in need of management” in Tennessee and North Carolina (Walters et al. 2002). Rather than concern for how to increase the Yellow-bellied Sapsucker’s population, the greatest concern is usually how to control its population. Many consider the Yellow-bellied Sapsucker a pest on trees because it girdles the bark of trees, especially those in orchards and backyards. Roberts (1932) even called the species “the evildoers among the Woodpecker tribe, so far as the interests of man are concerned” because of their girdling. It does this to obtain sap, which is how it received its common name. Lawrence (1967) estimated that each pair of sapsuckers only killed 1–2 trees per year by girdling. The benefits of this activity are that the sap attracts other wildlife species, such as hummingbirds that consume the sap, and that the sapsucker consumes many insects attracted to the sap (Foster and Tate 1966). Eberhardt (2000) suggested that even though some trees die as a result of sapsucker attacks, many animals may need sap for food. This sapsucker activity could have far-reaching implications for many other bird species in the forest community. Because the Yellow-bellied Sapsucker is protected by the Migratory Bird Treaty Act, it is illegal to shoot them. Regardless, shooting is considered an ineffective control method because transient birds can quickly replace local sapsucker populations. Eberhardt, Laurie S. 2000. “Use and Selection of Sap Trees by Yellow-bellied Sapsuckers.” Auk 117: 41–51. Foster, William L., and James L. Tate Jr. 1966. “The Activities and Coactions of Animals at Sapsucker Trees.” Living Bird 5: 87–113. Kilham, Lawrence. 1971. “Reproductive Behavior of Yellow-bellied Sapsuckers. I. Preference for Nesting in Fomes-Infected Aspens and Nest Hole Interrelations with Flying Squirrels, Raccoons, and Other Animals.” Wilson Bulletin 83: 159–171. Lawrence, Louise de Kiriline. 1967. A Comparative Life-History Study of Four Species of Woodpeckers. American Ornithologists’ Union Ornithological Monograph, no. 5. Anchorage, KY: American Ornithologist’s Union.